Well, spring is here. And wet pollen from the recent rain storm has stained our travertine deck. Any suggestions on how to clean? I'm thinking of using DuPont stone and tile cleaner and was interested in other alternatives. We have unsealed ivory travertine pavers. 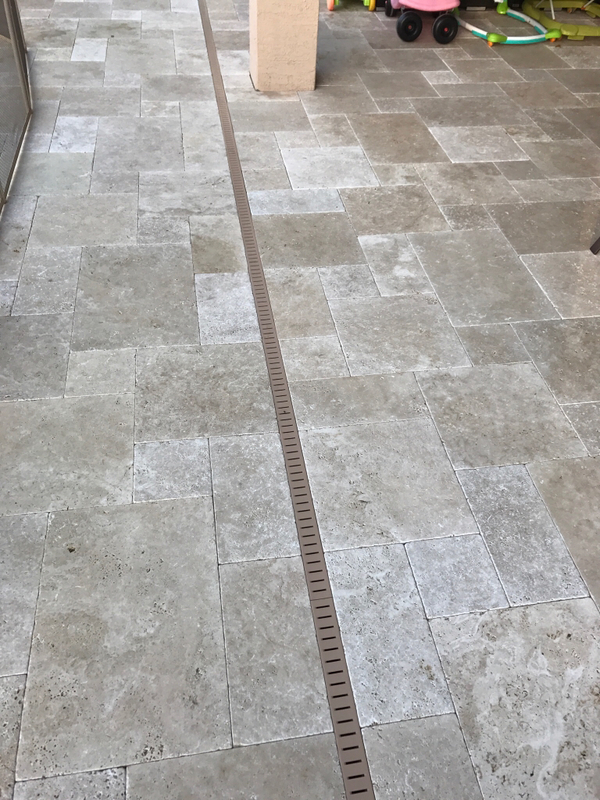 Travertine is very soft and easily damaged by chemicals. Be very careful with chemical cleaners. Yea if I can get this clean, sealing is looking more and more attractive. 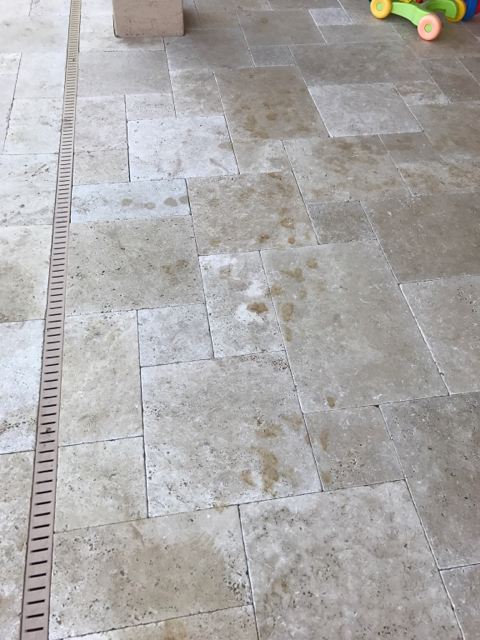 We have silver travertine as coping and it also is marked with some pollen and leaf stains. I finally just let it be and figure it's part of its "natural" look. I believe they have lightened up from last year though. But I understand your frustration. I was upset at first, but then decided to let it go. Yea. The ivory travertine is so light tho so it is really noticeable. When it is wet it is not as noticeable since the rest of the stone is darkened. We were really hoping to get away with not sealing it as we like the lighter dry look, but we can't reasonably be spraying down the deck every time the wind blows. I would bet a 3:1 chlorine/water mix would clear it up. Let the mix sit for a minute or so. The sun will oxidize some of it, too. I did a test at different dilutions and 3:1 is definitely too strong for the stone. 1:1 or less seems to be effective without staining the stone. I'm giving it a few hours for my test spots to fully dry before attacking any of the stains. The DuPont stonetech didn't do the job in lifting the stains. It's probably better for routine cleaning. I wonder if I can use the stonetech in my power washer for cleanings? I would avoid anything acidic, even water with a pH down near 7 can be aggressive towards the travertine. I mentioned steam cleaning and I was actually kind of serious about it. I have a steam cleaner (the kind with a wand, not a carpet cleaner) and it is very useful for pulling up organic stains as opposed to trying to use something caustic to lift an organic stain. I actually use it a lot on my BBQ to remove oils and greases that build up on it as well clean outdoor tiling with it. One other option, although difficult to find, would be to use a high concentration form of peroxide to bleach the stains. You would want about 10-12% peroxide mixed with a few teaspoons of ammonia (straight ammonia, no lemony or pine scents). The ammonia raises the pH of the solution and de-acidifies the peroxide (peroxides are stabilized at low pH typically less than 5). The ammonia will help to lift and dissolve greases while the peroxide will bleach organic staines. Using peroxide & ammonia avoids the use of chlorides which can be detrimental to the stone over time. 27% peroxide solutions can be found at pool stores that sell Baquacil products as the peroxide is used as the oxidizer in Baqua-pools. Just be careful handling high strength peroxide as it is a bleaching agent and it will bleach skin. Like all chemicals, you want to wear gloves and eye goggles, and long sleeved clothing to protect yourself. Looks great! I may have to try it. I'm guessing you've got to get to it relatively quickly. It was about 2 days later. I have some older stains that wouldn't come up at all. Thanks! It was worth the elbow grease. I have used rubbing alcohol to clean our travertine inside. Might be another thing to try. Also a water "poultice"; easier to do with a small stain - find something to form a closed ring or area around the stain and fill with water and let the water soak in and lift the stain out. I have read about the poultice, but "ain't nobody got time for that!" I'm a titos kinda guy these days...but agreed! Funny how a little vodka can cure almost anything!